Banana and chocolate for me, is a match made in heaven. The flavors alone are wonderful... together they make my mouth do a happy dance. To Read More, Click On The Recipe Title. 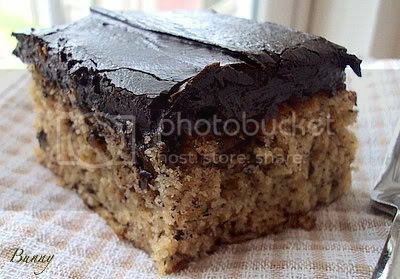 I made the banana cake recipe from Allrecipes.com , and the chocolate frosting came from Hershey Chocolate. I made this for our weekly family dinner. As I stood watching my brothers, their wives and my mom take their first bites of the cake, I asked if they liked it? With their mouths full, nodding their heads with mmmmm hhmmmmms they gave it a thumbs up. This is indeed an A Number 1 Banana Cake. So, what did they think of the frosting ? They couldn't believe how smooth and soft it was. Thank you, Hershey Chocolate, for another great recipe! This one came off the back of the cocoa can. The butter for the frosting is melted before adding the dry ingredients, which made for a wonderful frosting, I'll be using it again. 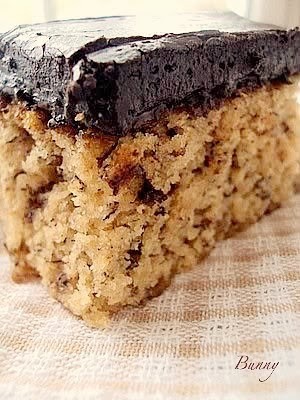 As I said, chocolate and banana are a match made in heaven, and these two recipes together are perfect! Preheat oven to 350 degrees F (175 degrees C). Grease and flour 2 - 8 inch round pans. In a small bowl, whisk together flour, baking soda and salt; set aside. That pumpkin bread sounds divine...best of all worlds! Lots of great fall treats. I've heard so many rave reviews of the Perfectly Chocolate Frosting. I need to give it a try. It all looks so delicious and I just adore banana bread. I've made that frosting before and think it's a great idea to add it to the banana bread. I had never thought of that! Carol you are as busy as ever! I've never heard of Affogato before but I just printed off your recipe. It looks wonderful. Bunny - your cake looks outstanding! I literally want to eat a huge hunk of it right off the screen. It's 5:24 a.m., I am drooling here, and my stomach is GROWLING!!! I think I've woken up the cats! i've missed your blog! i have little time now to visit blogs :( but i'm glad you stopped by mine to say hi! Everything looks incredibly delicious...but I have thing for the banana chocolate-frosted cake. How utterly scrumptious! Tracie, oh you brought tears to my eyes! How very frustrating for you to loose all those wonderful recipes! I'm so happy i could at least give you one back! You are so welcome sweetie!! mary, i am so thankfully i found you through pinterest and follow your food boards so little by little my new recipe files are being replaced! it's been such a trial and error process with trying to find good recipes and then trying to perfect them as i deal with european flours and ingredients for american recipes. getting there though.